The Android P Beta is available for Google Pixel lineup. Further, the beta update will be available on smartphones including Sony Xperia XZ2, Xiaomi Mi Mix 2s, Nokia 7 Plus, Oppo R15 Pro, Vivo X21, OnePlus 6 and Essential PH-1. Google has introduced its next-generation of the Android operating system during its annual developer conference, Google I/O 2018. The latest Android version will be known as Android P and it focuses on simplicity, intelligence and adds a slew of new features. The Android P Beta is available for Google Pixel lineup. Further, the beta update will be available on smartphones including Sony Xperia XZ2, Xiaomi Mi Mix 2s, Nokia 7 Plus, Oppo R15 Pro, Vivo X21, OnePlus 6 and Essential PH-1. “Android P is an important step toward bringing machine learning to everyone with an operating system that learns from you, adapts to you and helps you with everyday tasks,” the company said in a blog post. With Android P, Google has introduced a new system navigation. The latest version is all about gestures to enable navigation right from the home screen. With the new design, users can swipe up to see the new layout and then use gestures to toggle between different recently used apps. This makes it easier to switch between different applications, the company said. Android P also brings a redesigned Quick Settings, which will allow users to take and edit screenshots, simplified volume controls, an easier way to manage notifications and more. Android P also brings a host of new Smart settings to the table. To start with, the new Android version comes with Adaptive Battery, which basically prioritizes battery power consumption only for the apps and services that users use the most. This feature will help increase the battery backup of a smartphone. Secondly, there is Adaptive Brightness, which sets the brightness according to your surroundings. Thirdly, there are App Actions, which predicts what users want to do next. So, for example, when you connect your headphones to your device, Android will surface an action to resume your favourite Spotify playlist. Actions show up throughout Android in places like the Launcher, Smart Text Selection, the Play Store, the Google Search app and the Assistant, the brand said. Then there is Slice feature, which will allow users to deeper look into their favourite apps by searching in Google Search. So, for example, when you search Lyft in Google search, you will see price and time for a trip to work and you can order the ride directly from that place. Google is also bringing machine learning to app developers with the launch of ML Kit, a new set of cross-platform APIs available through Firebase. ML Kit offers developers on-device APIs for text recognition, face detection, image labelling and more. 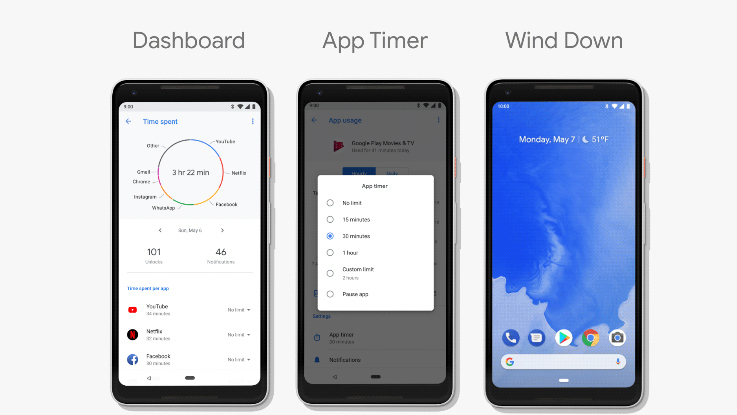 Google has also introduced a host of new wellbeing features on the Android P. The brand has introduced Dashboard, which shows the amount of time you are spending on your device including time spent in apps, how many times you’ve unlocked your phone, and how many notifications you’ve received. App Timer lets you set time limits on apps and it will automatically nudge you when you are close to the time limit and then grey out the icon to remind you the time is over for the particular application. Then there is new Do Not Disturb mode that silences phones calls and notifications as well as visual interruptions that pop up on the screen. The brand has also added a new gesture through which if you turn your phone over on the table, it automatically enters Do Not Disturb. Finally, Wind Down will switch on Night Light when it gets dark, and it will turn on Do Not Disturb and fade the screen to grayscale at your chosen bedtime to help you remember to get to sleep at the time you want.